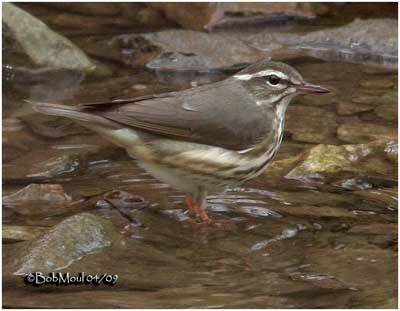 Louisiana Waterthrush presents a contrast between white underparts and salmon-buff flanks. Eyebrow is bicolour, with pale buff in front of eye, and white and much broader behind eye. White underparts show a dark spotting and pinkish buff on flanks. It has white and unstreaked throat. Upperparts are dark brown. Louisiana warbler is a heavy-bodied warbler. Tail is short and dark brown. Bill is heavy and large. Legs are relatively long and pink, as feet. 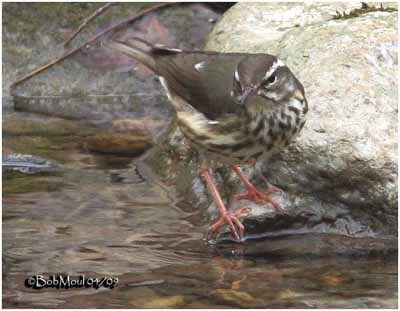 Louisiana Waterthrush has relatively small breeding range, low overall density, and dependence of clear forest streams, in breeding and wintering areas. Populations appear to be stable, but the most important threat is fragmentation of forests and drained swamps, and cowbird parasitism. Adults fall prey to small raptors, and eggs and chicks are food for snakes, small mammals and Blue Jays. 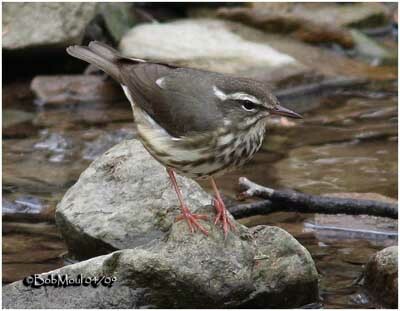 Louisiana Waterthrush is found along mountain streams in dense woodlands, also near ponds, and in swamps. It also likes stony rivers. Louisiana Waterthrush breeds in Eastern United States, from S Great Lakes region to S New England, and from E Texas across the Gulf States to N Florida. It winters in Central Mexico, and in S Florida, and throughout West Indies. 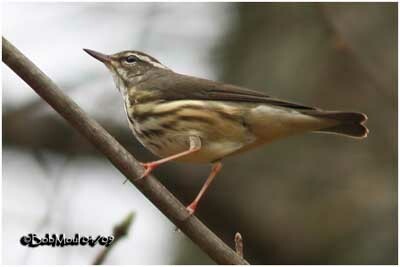 Louisiana Waterthrush is a ground dweller. It walks, rather than hops, bobbing its tail constantly, but usually slowly. It forages mainly on ground, within the boundary of a stream channel. It primarily picks, or takes quick-jab-like strokes directly at food items, or at herbaceous plants, leaf litter soil, rocks and moss. Other strategy includes leaf-pulls. Louisiana Waterthrush grasps a dead leaf in the water, pulls it upward to expose hidden preys. Occasionally, it may sally upward for flying insects, or hover-gleans prey from vegetation too high to be reached from a standing position. It also may hawk insects from the air. When it is walking, it wags entire back half of body and tail up and down. Louisiana Waterthrush’s nest is located on ground, along stream banks, hidden in vegetation, or among the roots of fallen trees, in crevices, or in rock walls of ravines over water. They prefer cavities in which entire nest is protected above. A “road” of leaves is often built from the nest to the water. Nest is a cup made with moss, leaves, twigs and bark. Both adults bring nest material, but often female builds nest alone. Female lays 4 to 6 white or creamy-white eggs, spotted and speckled with reddish-brown. Incubation lasts about 14 to 16 days, only by female. Both parents feed the altricial chicks, and male appears to feed them more often than female. Young fledge at 10 days, lured by adult’s “chip” notes, to protective vegetation. Young can fly 6 days after fledging, and they feed on their own at 7 days. This species produces a single brood per year, sometimes two if the first is lost. Louisiana Waterthrush feeds on aquatic insects and invertebrates, crustaceans and molluscs, and also small to medium flying insects. Sometimes, it may eat some small fish, and small frogs. Juvenile has dark brown upperparts with buff wing bars. It is duller, with olive-brown streaking on buff throat, breast and flanks. It shows a pale buff and olive-brown mottling on sides of head. Eyebrow is whitish, bordered with a dark brown stripe behind eye. Louisiana Waterthrush differs from Northern Waterthrush by the contrast between the white underparts, and the buff-coloured flanks. It has more conspicuous eyebrow and larger bill. Legs are pinkish. 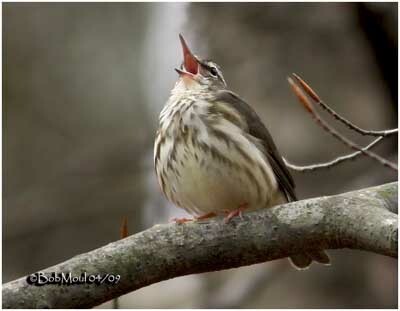 Louisiana Waterthrush’s call is a sharp “chink”. Both sexes utter a “zizz” call during courtship. Usual song includes 2 to 5 loud and clear, whistled introductory notes as a slurred ascending “seeup-seeup-seeup”, followed by a complex jumble of short phrases, rapidly uttered. Female gives a rudimentary version of the same song. Territorial neighbours engage in vigorous chases and counter-singing soon after arriving on breeding grounds. Males sing while in pursuit. Other behaviour shows males face each other, performing a flapping display by quickly raising wings above back, then lowering them in a jerky manner. Courtship displays show birds face each other on the ground, uttering “zizz”, sometimes simultaneously. Male may make sudden, short, erratic flights, and land near female. If she flushes, male follows her until they return to same general area. If it doesn’t flush, female may walk slowly ahead of male with wings partly outstretched and vibrating, with her head thrown upward, past the vertical. Then, pair may copulate. Pair begins searching for a nest site within a day after pair formation. Male chooses a site, turning around several times, dragging leaves into cavity, and calling softly to nearby female. If she doesn’t enter, male searches other site. Louisiana Waterthrush has an agile and rapid flight, hovering to feed, or performing flight displays during courtship. It takes off from the ground, flies upward to a great height, singing.